Asia's race for the north: What are new players looking for in the Arctic? Global warming and the contraction of the Arctic ice cap are not only turning the resource-rich region into an alternative to the Suez Canal but are also boosting claims to it from countries that traditionally were not considered to be contenders for that region. 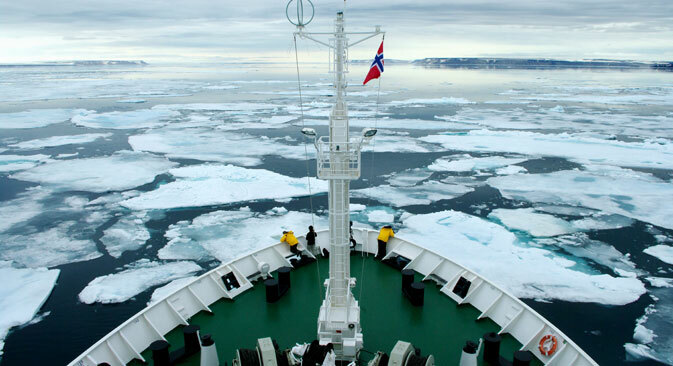 China, Korea, India and other Asian nations: What are each of them looking for in the Arctic? For the rapidly growing Chinese economy with its critical dependence on imported resources, the development of huge oil and gas reserves lying at the bottom of the Arctic Ocean is a very attractive option. In the estimates of the International Energy Agency, by 2020 China will become the biggest oil importer in the world, and by 2035 the Chinese economy will require 13 million barrels of oil a day. For China, the safety of its oil imports is a pressing issue: Half of its supplies come from the unstable Middle East, while 85 percent of its imported oil is channeled through the 1.5-mile-wide Strait of Malacca, which houses a U.S. naval base. That is why Beijing, with is claims to a global role in world politics, is desperately looking for opportunities to diversify its sources of oil. For India, a presence in the Arctic is more a matter of prestige since the country is positioning itself as a potential world leader and a traditional leader of "third-world" countries. There are currently two Indian stations operating in the Arctic: Himadri and IndARC, which was opened in August 2014. India, like China, is also showing an interest in developing northern resources. For example, the company ONGC Videsh Ltd. (OVL), a subsidiary of the Oil and Natural Gas Corporation (ONGC), has been holding talks with Russian oil giant Rosneft about participation in offshore oil production, but progress has been rather slow. However, increased tensions in Ukraine, the sanctions imposed against Russia by the West and Moscow's declared “pivot to the east” have changed everything. For Tokyo, the most attractive option is the development of a northern route that could be used to deliver goods to Europe, gaining up to a fortnight in delivery times, as well as to receive the Russian, Norwegian and Danish liquefied gas that the Japanese economy needs so badly. Tokyo considers cooperation with Moscow on the Arctic issue as an opportunity to reduce mutual tensions over the disputed Kuril Islands in the Far East. Furthermore, Russia is viewed as a partner with whom contact may help restrain China's ambitions in the Arctic. Japan’s leadership understands that Moscow is interested in diversifying its exports and is ready to help it with it. South Korea is a relative newcomer to the Arctic: Its first research station, Dasan, was set up on Spitsbergen in Norway’s Svalbard archipelago only in 2002. Nevertheless, Seoul quickly proved that it had come to the region to stay: The South Korean government adopted an Arctic Strategy listing the following priorities: establishing international partnership, developing scientific research and establishing economic cooperation. Seoul is paying particular attention to the support of the Arctic's indigenous peoples, protecting their rights and promoting their culture. South Korea's spending on Arctic research has exceeded similar spending by the U.S. Even Singapore has its ambitions in the Arctic. Being the world's major logistics center, it wants to retain this status after the northern transit route is established, although this will not be easy as Singapore will have to compete with all the Asian participants in the Arctic race. At the moment, Singapore is mainly interested in the wealth of the Arctic's oil reserves. The Singaporean industry is busy developing drilling and port infrastructure technologies that make it possible to operate in Arctic conditions in the hope for a niche market in which Singapore would have a decisive advantage.